Breech Baby at 35 Weeks? What Are the Options For A Breech Baby At 35 Weeks? A breech baby at 35 weeks means a presentation, at the 35 week point of pregnancy, when the baby about to be born is being delivered feet first rather than the more usual head first orientation. The following article describes a chiropractic protocol designed to help moms in these situations have an easier safer delivery. 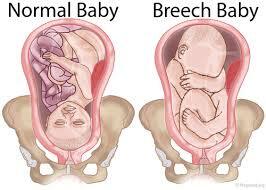 Breech baby deliveries represents around 4% of presentations. Until 40 years ago breech vaginal deliveries were fairly normal until medical facilities in the US called a halt on training in breech delivery methods, instead opting for C-section deliveries. Recent studies show that there is no more risk in breech deliveries than C-section deliveries, but the knowledge base to perform the breech delivery is now virtually lost. With chiropractic care, there is a protocol called The Webster Technique which has been shown in studies to help mom have a safer, easier birth. It was developed by Dr. Larry Webster who was the founder and defender of the International Chiropractic Pediatric Association. Whilst the Webster technique has historically been known as a method of turning a breech baby naturally – the great news for mom is that it is now been shown to help ALL pregnant mothers have easier, safer pregnancies. So, if you are pregnant, it would make sense to use a Webster-trained chiropractor as part of your birthing preparations. Please direct pregnant friends or family members to International Chiropractic Pediatric Association website to find a Webster certified chiropractor or feel free to contact the Team at Loving Life Chiropractic and we will schedule a consultation to see how we can best help you.